A Thin Blue Line flag plaque is back up at the Capitol after it was removed over concerns that it could actually represent opposition to the Black Lives Matter movement. A Thin Blue Line flag plaque is back up at the Capitol Friday after it was removed over concerns that it could actually represent opposition to the Black Lives Matter movement. 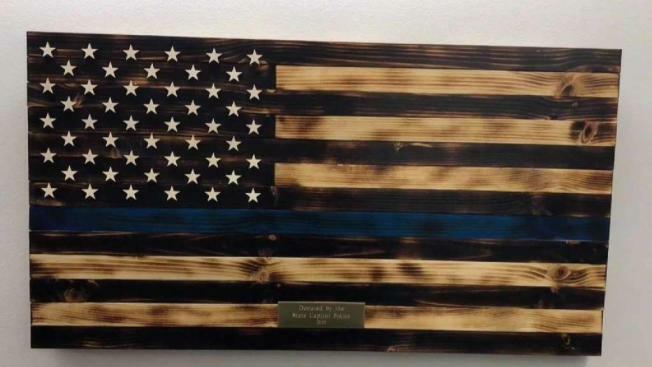 A handmade wooden plaque was donated weeks ago by a member of the Capitol Police. 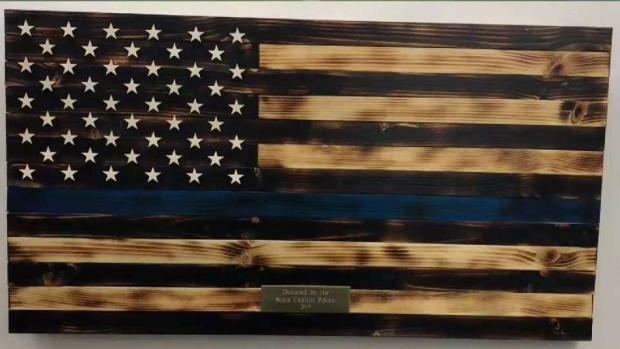 The office of Legislative Management said they decided to hang it in the police memorial in the concourse that connects the Legislative Office Building to the Capitol building. The thin blue line is recognized by many as a symbol of support for law enforcement. The artwork was removed when others raised the viewpoint that it could be seen as a symbol of opposition to the Black Lives Matter movement, and it was seen during a Unite the Right rally in Charlottesville in 2017. The plaque’s removal Tuesday was met with strong pushback by some in the law enforcement community who felt the action was an attack on police, and support quickly rallied to demand it be replaced. What some say is artwork supporting police at the Capitol has been removed over concerns that it could actually represent opposition to the Black Lives Matter movement. "There are very good reasons why it came down," said Sen. Gary Winfield. Winfield, a Democrat, said it's added context, not a lack of support for police, that prompted him and others to be concerned by the flag's appearance at the Capitol's police memorial. "Part of what's being missed here, the whole story has been about the offense that this removal of the flag is to the police, but I think we have to think about context," Winfield said. The Connecticut Fraternal Order of Police sent a statement saying "I am very happy to see that the flag has been placed back up where it belongs. I thank both Republican and Democratic party leaders who assisted me in making this happen." Some in the law enforcement community have previously rejected the idea of any connection between the white nationalist movement, Blue Lives Matter, and the thin blue line symbol. Artwork in the concourse is usually put through a vetting process, but the Office of Legislative Management said they felt the piece was appropriate to hang without vetting in a corner that is specifically reserved for the police memorial, and that they also made the initial call to take it down.